Royal Stafford Fine Bone China - "Roses to Remember" Pattern - Made in England in 1992 - Totaling (20) Pieces. 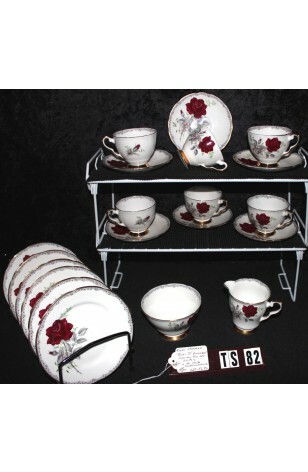 A simply gorgeous Design by Royal Stafford Bone China of England, with it's "Roses to Remember" Pattern. Having a White Background, with a Deep Red Rose, Tan Stem, Gray and Green Foliage, and Gray Outer Rims. Each Plate has White and Red Flowers on the Outer Scalloped Rim. All Pieces are Trimmed with beautiful 22kt Gold, with 22kt Gold Handles and Feet of Cups. A lovely Pattern for Old Time Style Weddings or Settings.